The BP Business Solutions Mastercard® offers spending flexibility, the freedom to use the cards where you need, detailed cost analysis, individual card control, and incremental rebates that benefit your bottom line. 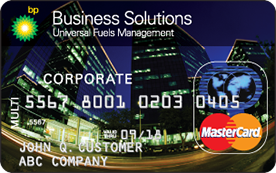 The BP Business Solutions Mastercard® provides your drivers with access to the highest quality fuels while providing rebates for your company. Plus, at the discretion of your fleet manager, your BP gas card can be used for fuel and maintenance purchases wherever Mastercard® is accepted. Even better, you’ll earn rebates on gasoline purchases at BP-branded locations around the country! Your account information is online in real-time 24 hours a day, 365 days a year. You can immediately monitor account data information for each driver and control purchasing ability for each card, including the ability to shut off cards or request new cards. To control possible fraud, you can set prompts to ask for vehicle or driver number and transaction will not be completed without a correct number. Prompts can also ask for the odometer reading to keep track of mileage for the MPG report. Start saving money for your fleet business today by choosing the right one. Fleet managers can save anywhere from 10-15% when selecting a fuel management solution. Just answer a few questions about your fleet and one of our experts will recommend the right fleet card program tailored to fit your business needs. Incorporated. Mastercard® is a registered trademark of Mastercard® International Incorporated.